Coo, coo! Is Ryouta in your grasp? Here's how to get him! So you've heard about Hatoful Boyfriend here and there, and you're curious. A game about dating pigeons? Say what? I mean, it gets stranger out there, but this one of the weirdest mainstream games out there currently for iOS and Android. Lo and behold, you've purchased it, and now it's time to get down to business. But what do you do? Good question. You pursue the love interest of your dreams of course! Because you're awesome, we've got a guide to getting every single ending possible. Just follow the instructions and make the correct choices and you'll be able to play through Hatoful Boyfriend to pick out the bird of your dreams in no time. From Ryouta to Sakuya, we've got you covered. Kaware Ryouta is one of the "main" characters, so to speak, and the protagonist's close friend. He's a nice guy, but he can be a bit of a pansy. He's still very willing to date you, and you can have him! Just follow these instructions. 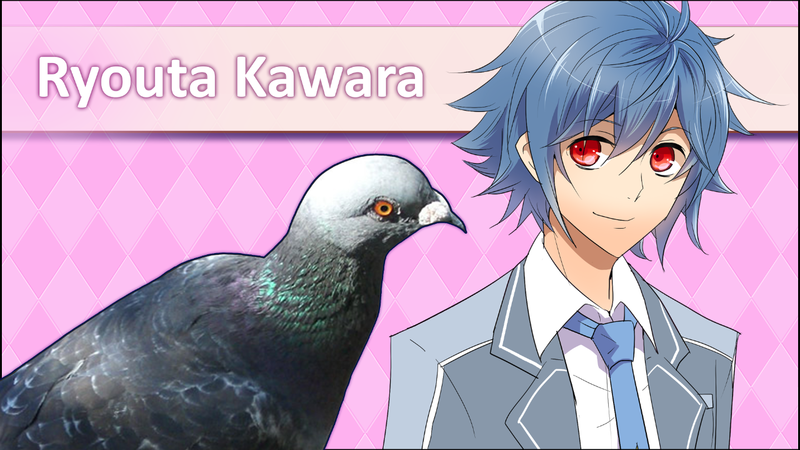 In Hatoful Boyfriend, you get a chance to choose 1 of 3 different classes: Math, Music, or Gym. You can also raise stat levels depending on what you say to who. These choices will also alter your ending. See the below guide for a guaranteed path to Ryouta's ending! See the date for instructions on how to proceed. Apr 11th: Choose to join the library staff. Apr 12th: Go to gym class. Apr 15th: Go outside instead of other activities. Apr 21st: Talk to Ryouta. May 6th: Go to gym class. May 21st: Attend the three-legged race. Jun 22nd: Go to the cafeteria. Jun 22nd: "Leave it to me!" is the correct dialogue option. Jun 26th: Go to gym class. Jul 7th: "Conquer the world by force." Jul 11th: Go to gym class. Jul 13th: Go yell at the doctor. Jul 20th: "What about OreHato?" Jul 24th: "I'll get a job." Aug 30th: Return to my glorious abode. Sep 3rd: Attend gym class. Sep 13th: "I would love to!" Oct 19th: "I'll ask for you when I go there." Feb 2nd: "I think I'll buy Calm Corn." While there are other discrepancies and other ways for you to achieve this same result, this is one of the quickest and most direct paths to getting the path you want. Make sure to check back for instructions for each bird aviary-lable in the game!